Games are without a doubt the most popular and profiting category of applications on Android, and today, after yesterday’s recap of Google Play’s best apps for the year, we have Google’s picks for 2012’s best games. Titled “Games We Love: Best Games of 2012,” nearly all genres are included starting with sports and racing, and going to good old shooters and action. As the year is 2012, so the picks are 12 accordingly. Best of all, half of them are available for absolutely free, and the other half is discounted to just a dollar. 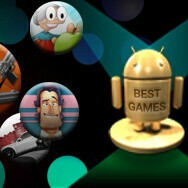 You can take a look at Google’s 2012 best game selection right below. We’d love to also hear your thoughs: what is your favorite game of the year? Naught by Blue Shadow Games S.L. where is MC4,angry birds,GTA III,etc etc...????!!!! ..and Dead Trigger, Asphalt 7, Cytus, etc etc...????!!!! GTA III debuted on Android last year. PhoneArena, the only website where you constantly get thumbed down for simply stating facts. The game came out in December of 2011. Look it up if you don't believe. I won't even waste my time by posting a link. For puzzle games, Machinarium was very cool. All android fans, copy and paste this link (without the spaces) ht tp :// lego. cuusoo. com/ ideas/ view/ 22758# and please﻿ support, it is awesome, at least look at it, please. Where's Temple Run, Angry Birds, etc. ?